Turn plain water into a refreshing sparkling soda in seconds with the SodaStream. Just fill with cold water, press the button to add fizz, add a capful of your favorite soda mix or MyWater flavor, and enjoy. And it's eco-friendly, versus bulky soda bottles. We're not soda drinkers here but own one of these fun machines and make tasty sparkling water regularly! 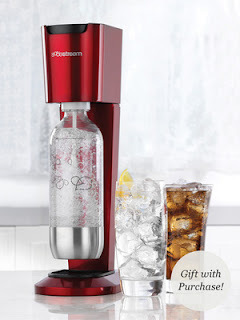 Purchase a Soda stream (model pictured is priced at $100 reg $130) from Gilt.com and you'll get free shipping, a free 12 piece holiday taste sampler pack Flavors include: Cola, Cherry Cola, Cola Free Tonic, Ginger Ale, Diet Ginger Ale Mango Energy, Cranberry Energy, Crystal Light Strawberry Energy Cranberry Raspberry, Orange Mango, Country Time Lemonade AND you'll get a $25 credit toward a future Gilt Home purchase HERE!